French serial killer Jeanne Weber was born on October 7, 1874, in northern France in a small fishing village and was also known as The Ogress. She was accused of strangling at least ten children, including her own. Jeanne was convicted of murder but was also found not guilty because of insanity and was declared insane in 1908 but she hanged herself at the age of 43 on July 5, 1918. 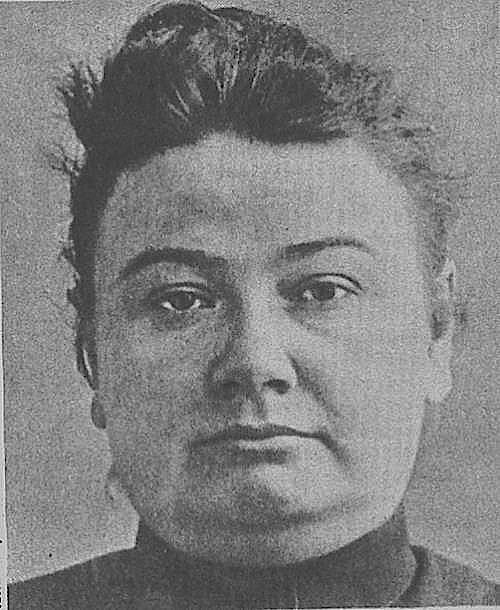 She went on this killing spree from March 2, 1905, to May 8, 1908, and was arrested on May 8, 1908. Jeanne Weber left home when she was 14-years-old and headed to Paris where she worked several menial jobs until she got married in 1893 to an alcoholic. She and her husband had three children, but one of them died in 1905. Jeanne also began drinking a lot and was also an alcoholic by 1905. Defense lawyer Henri-Robert and the jurors did not believe that a mother can commit such crimes, so she was acquitted on February 6. Jeanne was babysitting her sister-in-law two daughters on March 2, 1905, 18-month-old Georgette suddenly fell sick and died. The examining physician ignored the bruises on Georgette"s neck, and Jeanne babysat two-year-old Suzanne again on March 11, but Suzanne also died. Doctors said Suzanne died from unexplained convulsions. Jeane babysat her brother"s seven-year-old daughter, Germaine March 25. Germaine suddenly choked resulting in red marks on her throat, but she survived. Jeanne returned the next day and killed young Germaine. Doctors concluded her death to diphtheria which was also the reason for Jeanne Weber"s son, Marcel"s who died four days later. Jeanne Weber invited two of her sister-in-law to dinner on 5 April 1905 and stayed home with her 10-year-old nephew Maurice while her sister-in-laws went out shopping. The females returned home early to find Maurice on the bed gasping while his throat had severe bruises and Jeanne"s face having a crazy expression while standing over him. Her sister-in-law filed charges against her, and her case/trial began on January 29, 1906. The prosecution convicted her of eight murders, including her three children and two others, Lucie Alexandre and Marcel Poyatos who died in her care. It was assumed that she killed her son in March so that people would not suspect her of the murders. Jeanne was discovered to be using the name "Madame Moulinet" on 7 April 1907 after a peasant named Bavouzet called a physician to his home when "Madame Moulinet" appeared at his door. Madame Moulinet knocked on the peasant"s door to take him to his nine-year-old son Auguste Bavouzet who was laying on a cot dead with this throat severely bruised. Doctors concluded that Auguste died from convulsions" but changed their mind on May 4th after learning that Jeanne Weber was the same person as Madame Moulinet. Jeanne Weber hired lawyer Henri-Robert again and was released in December after a second autopsy was performed and concluded that Auguste died from typhoid. Jeanne Weber disappeared only to return later at a children"s hospital in Faucombault as an orderly and then leaving there to work at the Children"s Home in Orgeville. The Children"s Home was run by friends who Jeanne Weber was working under the name Marie Lemoine strangling a child within a week of working there. She was quietly fired, and they covered up her crime of strangulation. Jeanne Weber was arrested for vagrancy in Paris and was held in an asylum for a short period at Nanterre because doctors not too long after said she was sane resulting in her being set free. She delved into prostitution and picked up a common-law husband while doing so. They went to an inn in Commercy on May 8, 1908, and settled there until she was found strangling the innkeeper"s 10-year-old son Marcel Poirot, with a handkerchief covered with blood. The innkeeper punched Jeanne three times in the face before she released her grip from Marcel"s lifeless body. Jeanne Weber was declared insane October 25, 1908, and was sent to an asylum in Mareville but was credited with at least ten murders. She manually strangled herself on July 5, 1918, at the age of 43 after being held in the asylum for ten years. Her killing spree was from March 2, 1905, to May 8, 1908. Jeanne Weber serial killer is a female serial killer. The Ogress is a female serial killer. Madame Moulinet, Marie Lemoine is a female serial killer.